Rosella Namok - Lockhart River artist, paintings of the North Queensland coast. 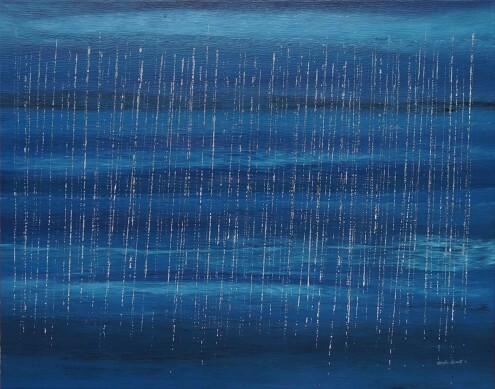 Queensland Aboriginal artist Rosella Namok opened her solo exhibition “Naagchi Ngumu’luugku – I Come from There: Lockhart River, Cape York” at Japingka Gallery in November 2013. Born in 1979, Rosella Namok is an Ungkum speaker who grew up in Lockhart River community. Rosella Namok’s lands are to the south of Lockhart River, and her totem is the Rosella. Rosella Namok began painting when she was still young, assisting her father to decorate the bodies of dancers using ochre paints in readiness for traditional ceremonies. As her father painted the dancers’ bodies Rosella would help with smearing the ochre clay onto the body and working it with the fingers to create the appropriate designs. The marks and patterns used on the body painting and on the ceremonial ground are highly symbolic. The ancestral markings remain as a significant element in Rosella Namok’s art today, along with other traditional symbols learnt from the sand drawing methods taught to her by her grandmother. In Rosella Namok’s work we can observe decorative finger painting as well as “scraping” of the surface. “I paint mainly about clan groups, country, family and what people do” says Namok. Other subjects include the seasons – the dry and the wet – and the rainforest. I also paint about the stories people tell me about, the spirits and carnival journeys to other communities.” Rosella Namok’s art finds a way to combine contemporary techniques with cultural narratives. Rosella Namok has participated in over 30 national and international exhibitions, and is represented in all major Australian public galleries. Rosella Namok works from her studio in Cairns. A selection of paintings by Rosella Namok is available from Japingka Gallery, where collectors can buy Aboriginal art online with certainty of quality, authenticity and provenance of art works. Aboriginal art status – Collectable artist.